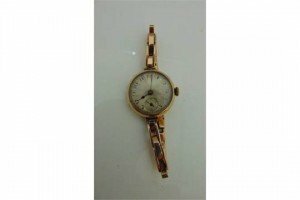 A lady’s 9ct rose gold wristwatch, the textured silvered dial with black Arabic numerals, subsidiary dial for seconds, case engraved with monogram, on a 9ct rose gold flexi-link bracelet strap. 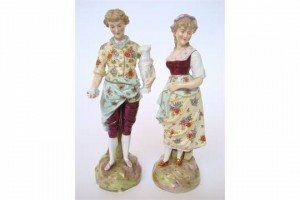 A pair of Meissen style porcelain figures, a man holding the fragments of an antique statuette of a goddess together with a female companion, underglaze blue cross swords mark. 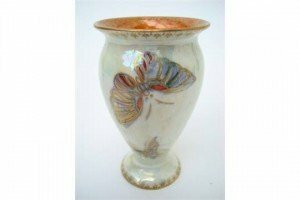 A Wedgwood lustre butterfly pattern vase, decorated on an opalescent ground with gilt rims, mottled orange interior, printed and painted marks. 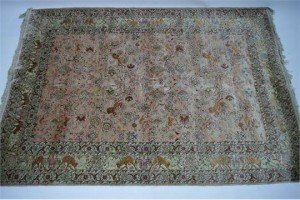 A Persian rug with ivory-ground centre panel, all-over design of flowers & birds within wide floral scroll borders. 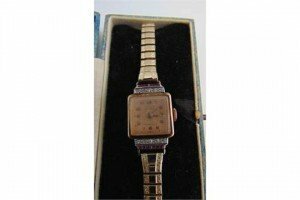 A lady’s Art Deco wristwatch, Titus Non Magnetic, the rose gold square dial with Arabic numerals, flanked above and below with a row of single- and old-cut diamonds, and a row of square rubies, in 18ct gold, on a gold-plated flexi bracelet strap. 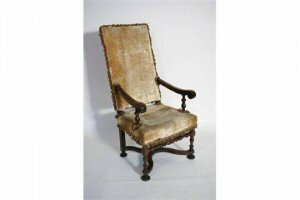 A 17th century-style continental carved walnut armchair, the tall rectangular back & seat upholstered pale yellow silk plush, turned supports to the curved open arms & on turned legs with shaped stretchers. 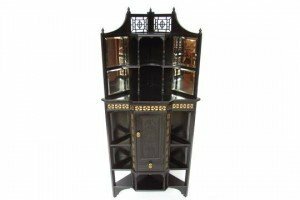 An Aesthetic movement ebonized and gilt corner cabinet, the upper section with pierced fret cut gallery and an arrangement of open shelves raised on spindle turned uprights, the base with projecting foliate carved central panelled cupboard door flanked by open shelves, with bevelled mirror panelled back. 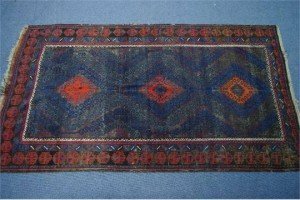 A Persian rug of aubergine ground with repeating hooked lozenge pattern in red & shades of blue, within a wide stylised floral border. 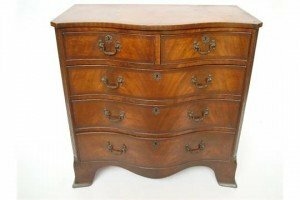 A George III style mahogany serpentine chest of drawers, the cross banded top above two short and three graduated long drawers, with blind fret cut canted corners, on splayed bracket feet. 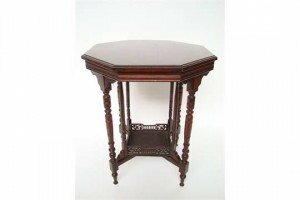 A late Victorian octagonal occasional table raised on a pair of ring turned supports united by an under tier, with fret cut gallery. 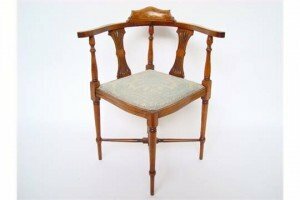 An Edwardian stained beech corner armchair, the marquetry and strung crest rail above open sides with pierced splats and padded seat, on tapering turned legs united by an x stretcher. 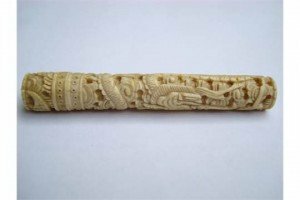 A 19th Century Chinese export carved ivory bodkin case, all over carved with a scrolling dragon among clouds. 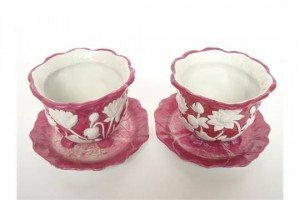 A pair of mid 19th Century Minton majolica jardinieres and stands, each relief moulded with white flowers, buds and leaves against a purple ground, on leaf moulded stands. 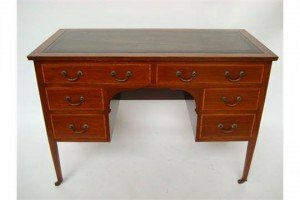 An Edwardian mahogany and satinwood cross banded writing desk, the top inset with gilt tooled green leather over an arrangement of six drawers on square tapering legs and brass casters. 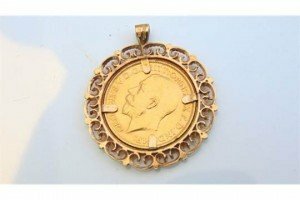 A George V full sovereign pendant, 1911, mounted in a 9ct gold frame. 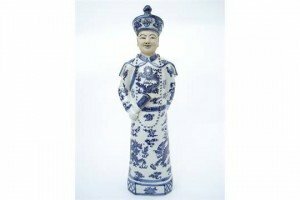 A Chinese blue and white porcelain figure of a mandarin, with biscuit face, dressed in printed red dragon robes, wearing a hat and a beaded necklace with a fan in his right hand, the base impressed with seal marks. 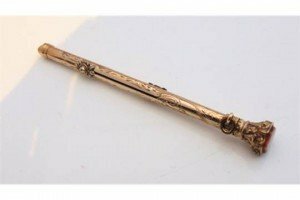 A Victorian gold-plated propelling pencil and dip pen, engraved with floral details, terminating with a shield-shaped hardstone finial. 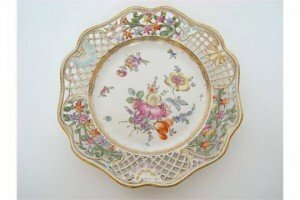 A late 19th Century Dresden decorated porcelain cabinet plate, the centre painted in enamel with a spray of flowers, the raised shaped borders reticulated and pierced with scrolling flowers. 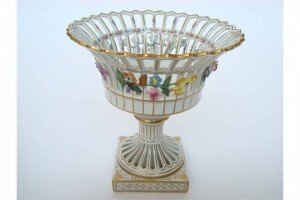 A Dresden porcelain comport, the openwork basket encrusted with floral sprays, raised on reticulated pedestal and square plinth base. 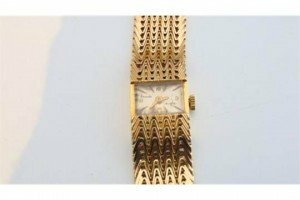 A lady’s French gold wristwatch, Exacta, the rectangular dial with gilt Arabic and baton numerals, on a mesh bracelet strap with folding clasp.